Once children become familiar with traditional nursery rhymes, it’s fun for them to read mash-ups. This new book by Alison Jackson, illustrated by Doris Barrette is a perfect example. In When the Wind Blew, a baby rocking in the treetop settles atop the old shoe home of a woman with many children. Thus begins the quest to return the baby to where it belongs. Jack and Jill, Mary’s little lamb, and Jack’s candlestick all make appearances in this rhyming picture book. Children familiar with these rhymes will delight in the mixed-up tale. 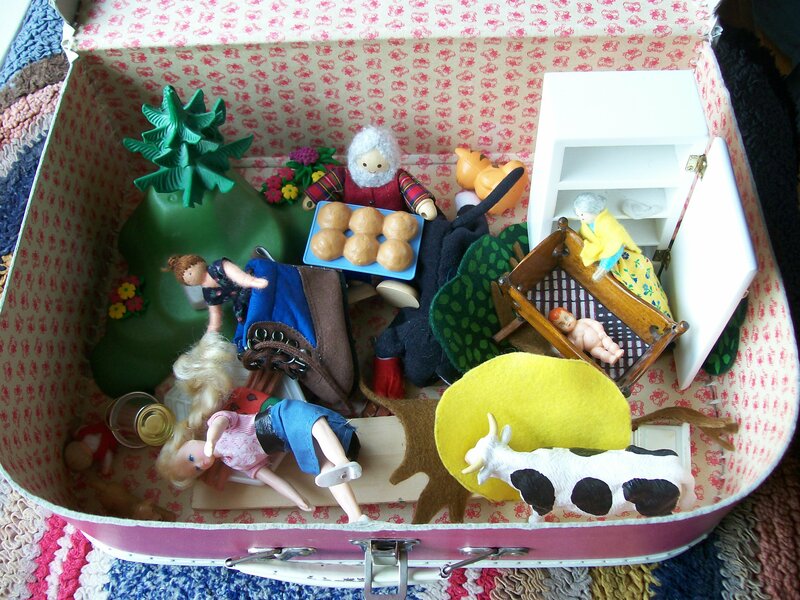 Looking through my collection of toys and things, I’ve put together a nursery rhyme mash-up suitcase. 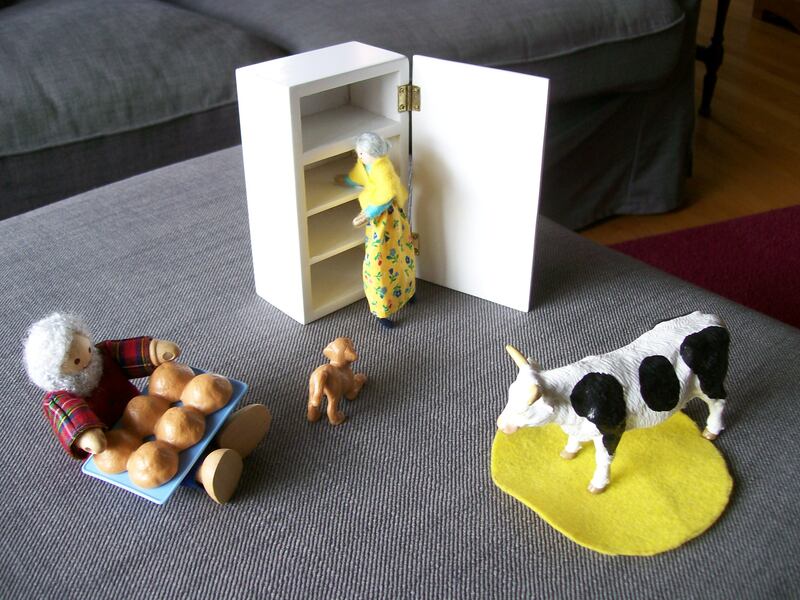 What happens if the Old Mother Hubbard is visited by the Muffin Man and the cow who jumped over the moon? 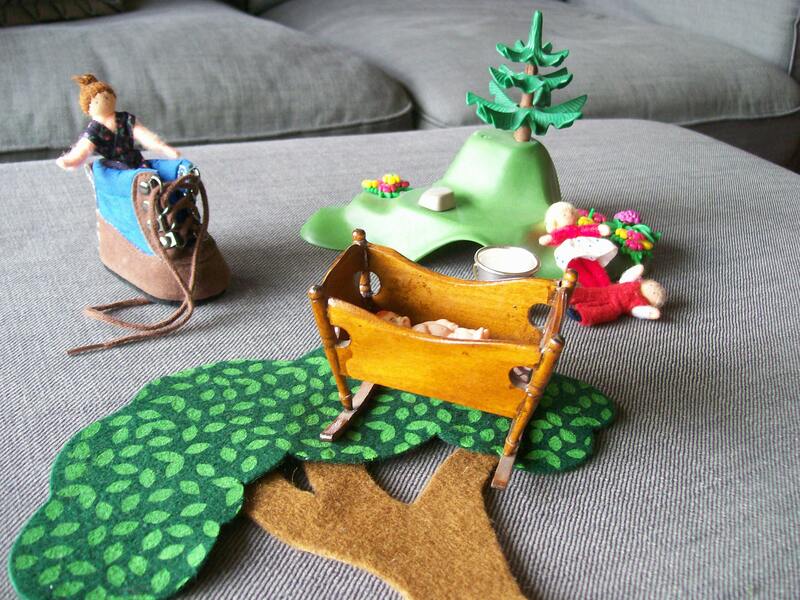 How about if the baby in the tree top and Jack and Jill all tumble onto the old woman’s shoe? What will she do with more children? Use your imagination and with your children tell stories of familiar characters in unfamiliar settings. I’m sure you can think of more! 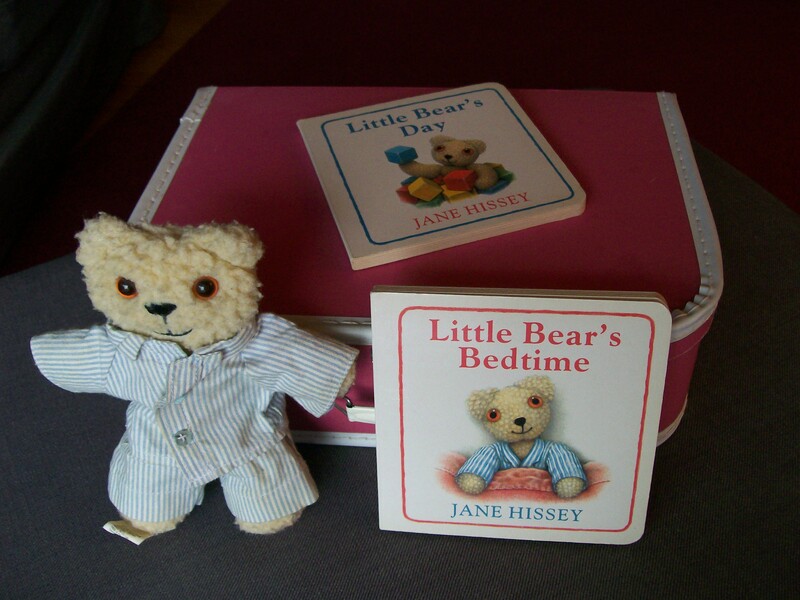 These two little board books featuring Jane Hissey’s Little Bear were favorites of one of my daughters. Each time she looked at them, she wanted to help Little Bear with all of his activities. As Michelle got ready for bed, so should Little Bear. This story suitcase provides all the necessary accessories for Little Bear’s day. Listening to a book and then acting it out step by step teaches memory and sequencing skills – both important for future readers. Further open-ended play with the objects allows for development of creative thinking and imagination. Asking your child to tell you what Little Bear is doing develops language and communication skills. Besides, it’s just fun! These books are no longer available in board format, but they are still available as cloth books. We were lucky enough to find a stuffed version of Hissey’s Little Bear years ago, but any small teddy bear would do. For more on Michelle’s thoughts about Little Bear, follow this link.